The future: If your smartphone supports wireless charging, XLayer's brand new PLUS Wireless Discover powerbank with integrated induction charging station is perfect for you, as it can recharge your smartphone without a single cable! 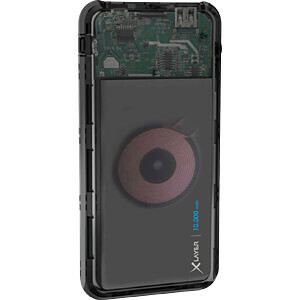 What's more, the transparent body of this powerbank lets you see for the first time the detailed inner workings of XLayer's technology. Simply place your compatible device on the activated charging station to start the charging process. Convenient wireless charging means this powerbank is ideal for use on the go and the integrated torch is the perfect finishing touch to this product, ensuring that you never lose sight of what's most important - even in the dark. An additional USB port also lets you charge another device at the same time. The handy format means the powerbank can be used in almost any situation. You can also use the integrated LEDs to easily read the remaining charge level at any time. A fifth LED below the power button also indicates whether your device is charging wirelessly (lights up in blue) or via cable (lights up in green). The powerbank itself can be charged via two charging sockets - micro-USB (cable included in delivery) and Lightning. 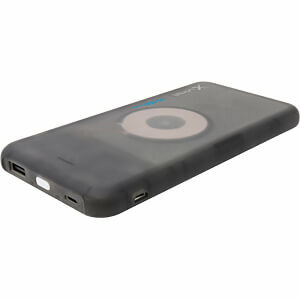 This powerbank is compatible with all smartphones, tablets and other USB-powered devices with a 5-V input.